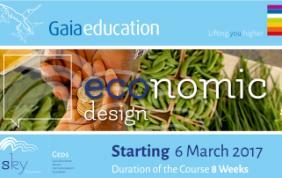 (15 February 2017) – Gaia Education’s eight-week online course on Economic Design will start on 6 March. It is time to step up our efforts to co-create a transformative response to the converging crises we all face locally, regionally and globally. One of the highest leverage points for transformation is the redesign and strengthening of our local and regional economies as a means to shift the global economy to being regenerative rather than destructive. Therefore you are invited to join the Economic Design dimension of Gaia Education’s Design for Sustainability online course. Learn why the structural design of our current economic systems no longer serves humanity, and what you can do in your community and region to become part of co-creating a regenerative economy. Sign up here to join a global community of committed local change-makers and learn how to apply economic design to relocalisation and in support of vibrant regional economies.